Actor Jason Scott Lee will be at Foster Botanical Garden's Holiday Plant, Art and Music Festival tomorrow to talk about natural farming. The star of "Lilo & Stitch" and "The Prophecy: Forsaken," among other films, is taking a break from his Big Island farm to take the stage from 11:15 a.m. to 12:15 p.m.
Miss Hawaii USA Chanel Wise and Dr. Terry Shintani will also make appearances during the 9 a.m. to 3 p.m. event. Festivities include wreathmaking workshops, free keiki crafts, and entertainment by Celtic with the guitar sounds of Michael Tannenbaum; the harmony of Fab 4 and the Oahu Civic Orchestra. 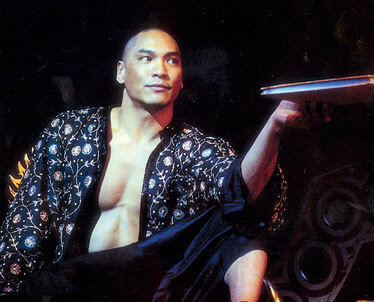 Actor Jason Scott Lee, shown performing the lead role in "The King and I" at London Paladium, will speak at Foster Botanical Garden tomorrow. Christmas just wouldn't be the same without the Honolulu City Lights program. You'll have a chance to meet the mayor and show your support by picking up the official 2007 Honolulu City Lights Ornament ($18) from noon to 2 p.m. tomorrow at Macy's Ala Moana Ku'u Home department on the fourth floor. Proceeds benefit the Friends of the Honolulu City Lights nonprofit group. This year's ornament, "Lanakila," features Shaka Santa and Mele riding on a train on the Honolulu Hale grounds.